Cedar Island The rapid landward migration of Cedar Island has stranded several vacation homes built in the 1980s. © C. Hobbs/VIMS. Parramore Migration A ghost forest and outcrops of marsh peat provide clear evidence of landward migration of Parramore Island. © Daniel Ciarletta/ Montclair State University. Barrier Island Migration Another vacation home stranded by the rapid landward migration of Cedar Island. © C. Hobbs/VIMS. If you’ve visited the Outer Banks or other barrier islands, you’ve likely experienced their split personalities—places where high waves can pound the sandy ocean shore while herons stalk placid saltmarsh waters just a short distance landward. New research by a team from William & Mary and its Virginia Institute of Marine Science shows that these seemingly disparate ecosystems are in fact closely coupled, and that rapid landward migration of barrier-island sands is leading to large-scale loss of adjacent saltmarshes. Their study—recently published online in Geology—focuses on the pristine barrier islands of Virginia’s Eastern shore, but is likely applicable to similar barrier-island systems worldwide. The team’s research shows Virginia’s barrier islands are eroding or migrating landward at 3 to 18 feet per year. They estimate the landward migration consumes at least 60 acres of back-barrier saltmarsh annually, and has buried almost 8,000 acres of these saltmarshes since 1870—nearly 10% of Virginia’s historical acreage of back-barrier saltmarsh habitat. Loss of marshes is of significant environmental concern given their beneficial role as feeding grounds for waterfowl, nursery grounds for numerous marine species, and ability to absorb carbon, pollutants, and wave energy. The study’s third co-author, VIMS assistant professor Dr. Matt Kirwan, notes that, “Virginia’s barrier islands are exposed to some of the highest rates of relative sea-level rise along the U.S. Atlantic Coast.” A 2015 VIMS study puts the rise rate at Kiptopeke on Virginia’s Eastern Shore at ~3.7 millimeters per year over the last 50 years. That’s a tenth of an inch annually, or more than half a foot of sea-level rise since the mid-1960s. An error scatter chart will load here! 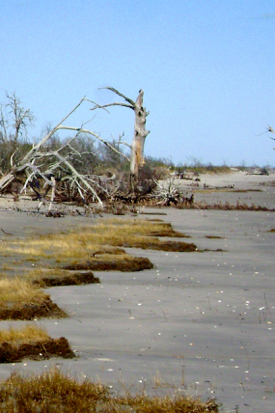 One hypothesis, based on both computer models and field observations, is that storm-driven transport of sands over a barrier island and into marshes helps the latter keep vertical pace with rising seas, while the presence of marsh close behind the barrier island stabilizes the island and acts to slow its landward migration. An alternative, conceptual model suggests that rising seas are drowning back-barrier marshes. Under this scenario, because more water can fill coastal bays as the tide floods in, more water needs to drain from them as the tide ebbs out. This requires larger cross-barrier channels to accommodate the increased ‘tidal prism;’ these in turn carry barrier sands into flood- and ebb-tide deltas—effectively removing the sediments the barrier islands need to survive. Starved of sand, the shoreline retreats, and the barrier island grows narrower, or migrates even faster. Deaton, Hein, and Kirwan say the primary coupling between Virginia’s barrier islands and back-barrier environments is the islands’ rapid landward migration. 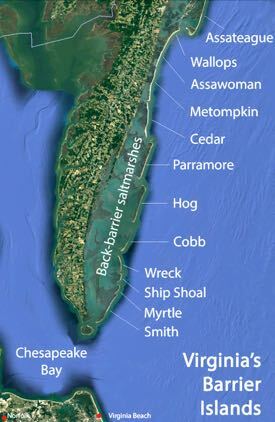 They estimate this accounts for more than half the region’s historical decrease in saltmarsh area, and say migration-induced saltmarsh loss can also be expected in similar mixed-energy barrier systems, such as those in South Carolina and New Jersey, as well as in Germany and along other distant shores. Funding for this study was provided by the National Science Foundation's Long Term Ecological Research program and Coastal SEES program (grants 1426981 and 1325430).